UPDATE (Oct. 4, 10:43 a.m.): You’re reading a vintage FiveThirtyEight story. Since this article was first published in May, the world’s oldest living person has changed. It is now Susannah Mushatt Jones, a 116-year-old who lives in Brooklyn. As the oldest person in the world, Gertrude Weaver was making the best of her time in the limelight. When I called the 116-year-old Arkansas resident two days into her reign on a Friday in early April, she was resting after a couple of television appearances and a half-dozen phone interviews. With the help of her 73-year-old granddaughter, she offered up theories about her longevity (“hard work, love God,” as her granddaughter put it) and even invited President Obama to her next birthday party. Kathy Langley, the administrator at Silver Oaks Health & Rehabilitation Center, the Camden facility where Weaver was living, estimated that Weaver was getting more than 50 calls a day from media outlets wanting to speak to her. “It’s somewhat overwhelming,” she said, asking me to call back Monday. When I did, I learned that Weaver had died that morning. Weaver was part of what is perhaps the world’s most wizened sorority, one open only to those who were once the oldest living person on Earth. When I looked into everyone who’d had that distinction, I found that more people than ever are clustering at the outer edge of human aging and that the tenure of the world’s oldest living person isn’t as long as it used to be. Better record-keeping and longer lifespans have helped lead to quite a crowd. Weaver’s five-day run as the oldest person in the world was short, but it turns out that the oldest person in the world never holds that title for very long. Since records started being kept in the 1950s, the average tenure has been just around a year, according to the Gerontology Research Group; it has dipped to just seven months since the year 2000. Weaver’s incumbency isn’t the shortest in recent years; North Carolina’s Emma Tillman died four days after becoming the world’s oldest person in 2007. When she died, Weaver was the seventh-oldest person in verified history. The woman who preceded her as the oldest living person in the world, Japan’s Misao Okawa, died a month after she turned 117 — older than all but four other people in verified history. (Okawa credited her longevity to lots of sleep and lots of sushi.) The current oldest living person in the world, Jeralean Talley, is one of 11 children of Georgian farmers and is the 12th-oldest verified person in history; Brooklyn resident Susannah Mushatt Jones is only 44 days younger than her. 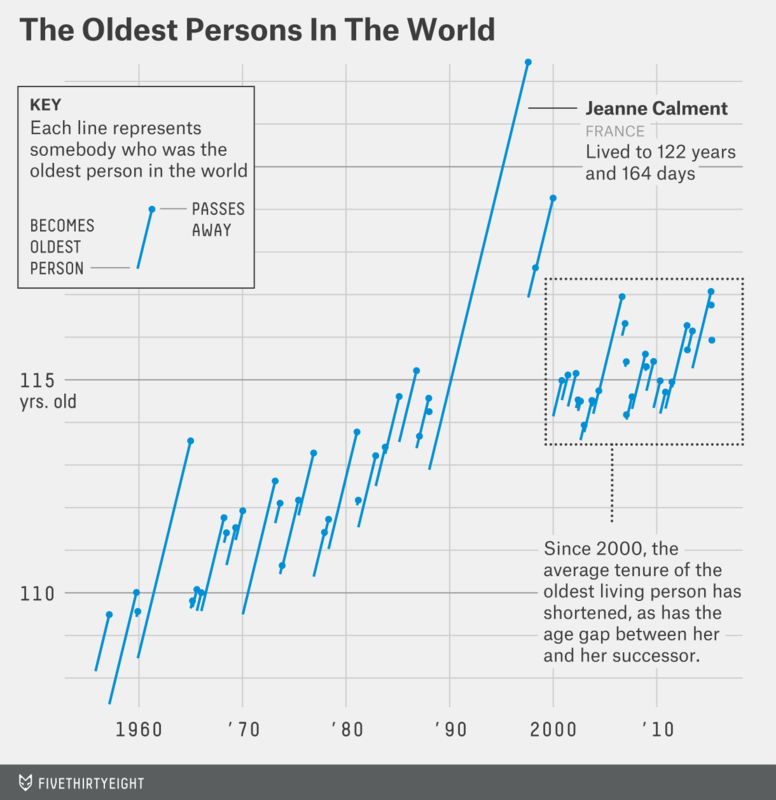 No one in the past 15 years has gotten anywhere close to the longevity of Sarah Knauss and Jeanne Calment, however. Knauss lived to be 119 years old, while Calment, a chain-smoking Frenchwoman and our modern Methuselah, was 122 years old when she passed away in 1997. (She was the oldest living person in the world for more than nine years.) They are the only two people known to have lived past 118. Supercentenarians — people who have lived past their 110th birthday — generally come from a heartier stock than most people. They tend to have few age-related health issues and are much physically and mentally sharper than their peers during their 80s and 90s. Weaver, for example, didn’t move into the rehabilitation home until she was 109. As we enter an age with less war and infection and fewer accidents, more and more people with these superior aging genes have been able to make it to a point in time when they can show them off. It’s getting crowded at the top. Aside from Knauss and Calment, however, the cutoff for mortality has remained relatively firm. Robert Young, a guy with a remarkable name considering he’s the senior claims researcher for the Gerontology Research Group and the senior gerontology consultant for Guinness World Records, refers to this phenomenon as the “rectangularization of the mortality curve.” People are getting older on average, but the oldest are still dying around the same age as ever. Thus, when one of them does take over as the oldest, she doesn’t have much time left. The average age of the oldest-ever people has increased over the past 40 years from around 112 to around 114. Weaver almost didn’t become the oldest person in the world, at least as far as the Gerontology Research Group and Guinness World Records are concerned. That’s because the daughter of sharecroppers doesn’t seem to have been issued a birth certificate, something that didn’t become common practice in the United States until 1933. However, she does appear in the 1900 census as a 2-year-old, and her marriage license — issued 100 years ago this July — shows that she was 17 at the time. But Weaver herself wasn’t sure when her birthday was, according to Young. Although she suspected that she was born in April, she adopted the country’s birthday as her own and celebrated on July Fourth. Young was satisfied that the available documents verified Weaver’s age, but only came across them recently. In 2014, he had the somewhat ignominious task of stripping Talley of her title of oldest living American and presenting it to Weaver. (Of course, Talley has it back now.) As more and more documents come online, though, researchers like Young are able to verify — and debunk1 — more and more claims, increasing the size of the data set in the process. Young’s work is far from done. He points out that most verified supercentenarians come from Japan and the U.S. While much of that geographical specialization may come from what he terms “lifestyle differences” between those places and the rest of the world, he thinks that as data collection gets better, we’ll start to discover more and more supercentenarians in other countries, most of which only started systematically keeping records of their citizens in the mid-20th century. As the number of these super supercentenarians grows, we should expect even shorter reigns from the oldest of them all. Perhaps that’s not necessarily a sad thing. In one of her last interviews, Weaver said that after gaining the title, there was simply nothing left to check off of her earthly bucket list. Old-age fraud occurs for a variety of reasons: to bolster religious beliefs, get status in the community, sell miracle potions, etc. But the most common kind of fraud is pension fraud, and one Japanese family took it to the logical extreme by claiming a long-dead, mummified relative was actually a living but sick supercentenarian.